You don't have to go to the Big Two publishers to find compelling superhero stories. In fact, you don't even have to leave your house to get your hands on one. 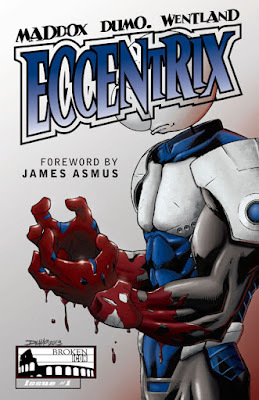 Take for instance the upcoming digital release of 'Eccentrix' #1 by James Maddox, Rob Dumo and Nicholas Wentland. It's an effective dark comedy about an alien hero whose heavy-handed approach to justice has his fellow league members worried that he's too much of a loose cannon. 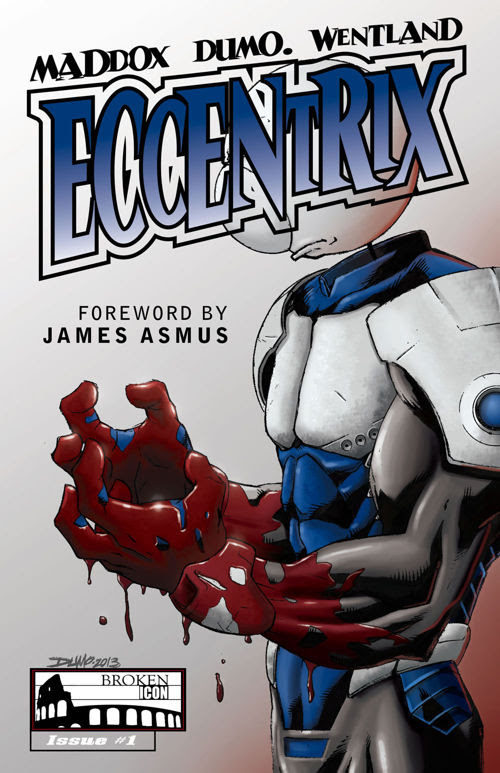 Coming from Broken Icon Comics, 'Eccentrix' represents independent publishing at its best. The story is as good as anything on comic book store shelves right now and the art is clean and vibrant. It's also edgy, violent, with a sly sense of humor. Meet Zipman, he most powerful being on earth. Certainly the most powerful hero in a league of heroes. Shogun, the leader, is not pleased with Zipman's reckless and deadly methods. Zipman doesn't understand what the big deal is. He's just administering deadly force to bank robbers, petty thieves, and giant robots. He's an equal opportunity agent of justice with zero remorse. He also loves the spotlight and it's becoming unbearable to Shogun. It's an intriguing set-up that feels original with enough moral ambiguity to cloud the definition of what makes a hero. Maddox quickly develops the characters and the story is off and running. Zipman is both funny and terrifying. A curious design with a typical muscle-bound exterior shell with a cartoonish head. Yet, it works because Zipman's bravado and sarcastic wit carries the action. Dumo and Wentland create an appropriately colorful superhero world full of creatively designed villians and layouts that accentuate the fighting from one panel to the next. Zipman's extreme prejudice of power in battle is represented with great rays of color that completely envelope his targets. There is an unpolished but fun energy to the art that exemplifies the spirit of indie comics. 'Eccentrix' is a well executed dark comedy adventure that hits all the right notes. It is worth seeking out to not only read a great story but support small publishers and talented creators. It will be available exclusively on Comixology beginning Wednesday, July 1. Do yourself a favor and buy this book.